From doughnuts, cupcakes, macarons, mille crepe, Taiwanese milk tea to shaved ice, there’s a certain period that many go gaga over them. Franchises for these products are mushrooming, same goes to the brands, varieties and flavours. When choices increase, consumers tend to narrow down the choices and pick their love instead of trying out blindly. Those with good quality continue to win the hearts of consumer, whether the fever has lapsed, or not. And those failed, will go the other way. 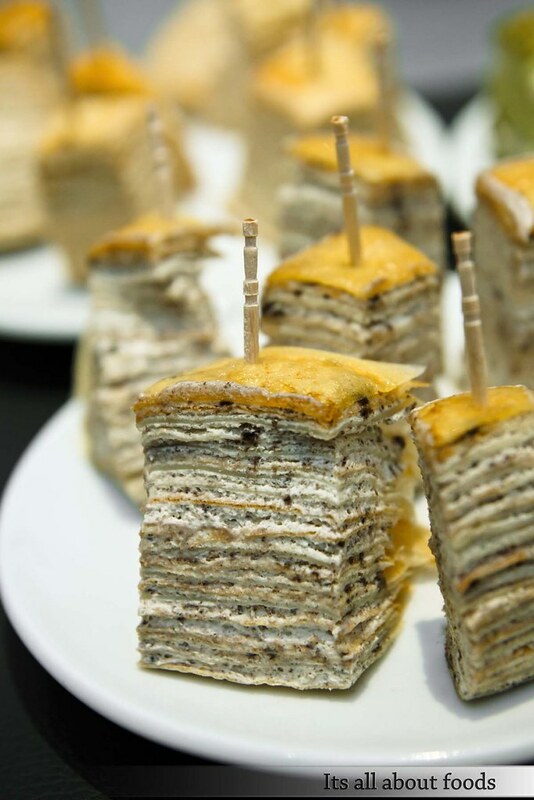 Humble Beginnings, the mille crepe specialist is a good example who manage to gain popularity over the years, regardless of the number of competitors that have also increase within these years. 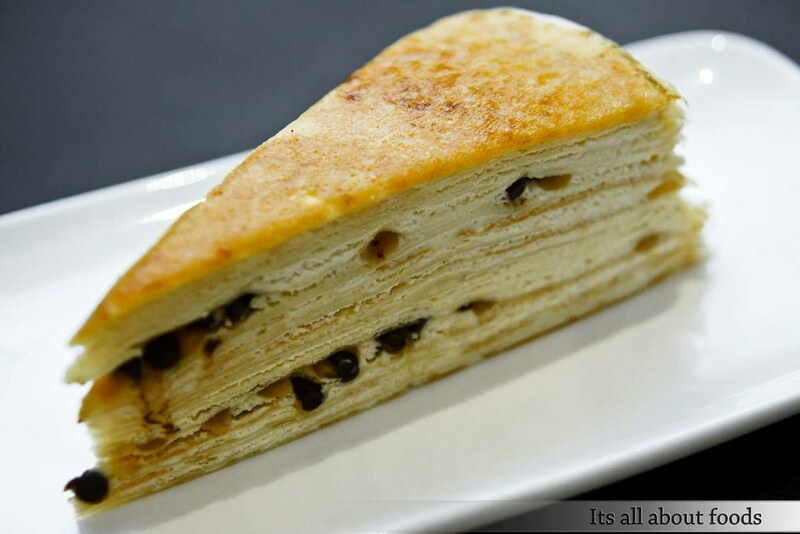 Started off back in 2007 in Johor, Humble Beginnings is the very first e-shop that specializes in home base fresh mille crepe for delivery. They do not have a physical shops, and so they couple with some florist shops and coffee shops that work as pick up points for customers. 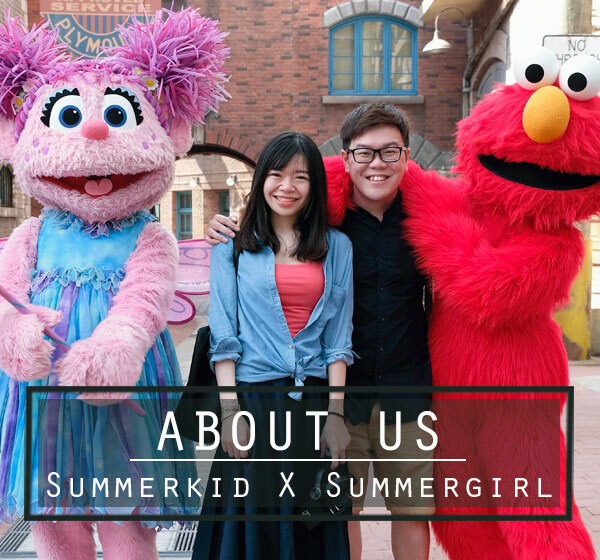 They expanded to KL, PJ, Penang, Prai, and Singapore later, building up popularity by word of mouth. Making an online order for their mille crepe is pretty simple. Step 1, Choose your cake size- regular(0.9kg) without toppings, regular with toppings, large(1.4kg) with toppings, large without toppings. Step 2, Choose your toppings if there is any- pick from blueberries, strawberries, lemon rind, white choc, dark choc, peanut butter, red beans, mango, peache, M&M’s, Reese’s, chocolate chips, oreo’s cookies, dark chocolate, etc. Step 3, Put on any description you wish to have on the cake, and ask for pre cut into 8, 12, 16, or cubes with toothpicks. Step 5, Pay using their online payment service, or COD. Step 6, Enjoy your mille crepe! Even though they have built their own names, things are not going on easy. Many may have heard of Humble Beginnings for long—like us, but since one can only taste it by ordering a whole cake, with delivery/pick up at certain pick up points only, this has hold them back from ordering one. The girl almost ordered one when she worked in Penang, but gave up at last for she did not want to stuff herself with the whole cake alone. So we are jumping with joy, when Humble Beginnings finally opens up a physical shop in Bangsar, Jalan Telawi. No more looking at the saliva dropping cake on their e-shop and imagine the good taste, we can now savour all flavours slice by slice, and back for more whenever we wish too. Halved with Subway, the current store used to be a florist shop, also a pick up location for Humble Beginnings customers. Space is limited with only handful of seats, but good enough to cater small groups of customers and for take away. 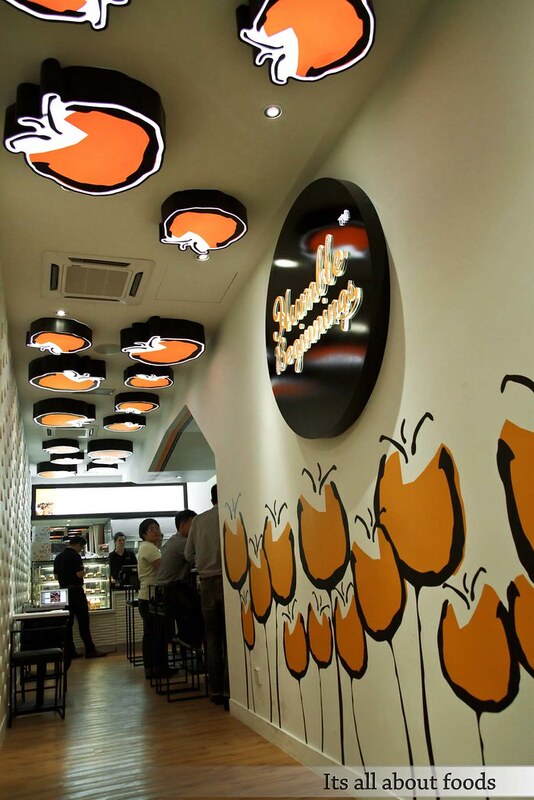 Walk through the wooden floor hallways, polka dots and tulips like illustration are seen everywhere, from the walls, ceiling, lamps, main entrance to packaging box. It is now more than just a shop name, but is a brand. Scanning through the display, you will be spoilt with choices. Cheesy cheese, chocolate orange, coffee bliss, french vanilla, lemon cream cheese, mango cheese, matcha latte, nutella banana, oreos cookies n cream, pandan kaya, strawberry heaven, swiss chocolate velve, peach passion, peanut butter blueberry, peanut butter chocolate, rasberry cheese yougurt, Reese’s surprise, and royal milk tea. Priced at RM9.90 per slice. 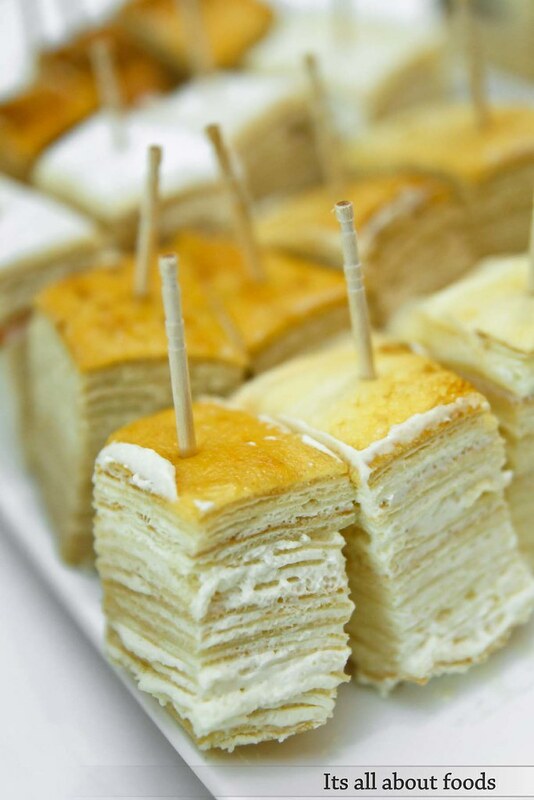 20 layers of crepes in each cake, with fresh cream and vanilla custard layering between one another. Each layer is handmade, hand-layered, time consuming but well done with care and love. The top most layered is caramalized, promoting nice sugary smoky sensation. 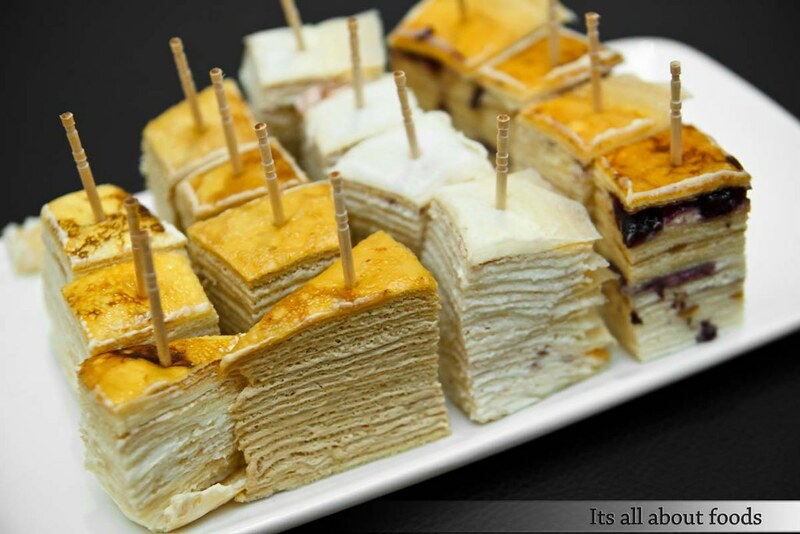 Flat crepe is one of the essential requirements towards a good mille crepe. 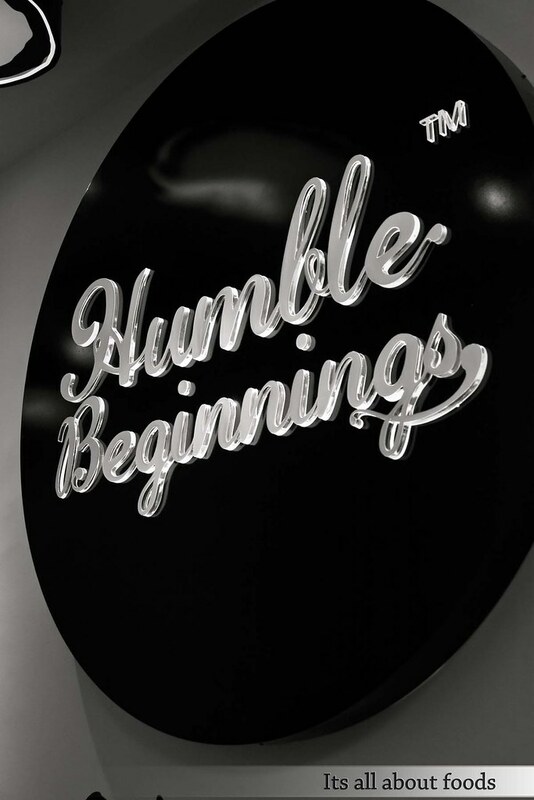 And Humble Beginings does that well. 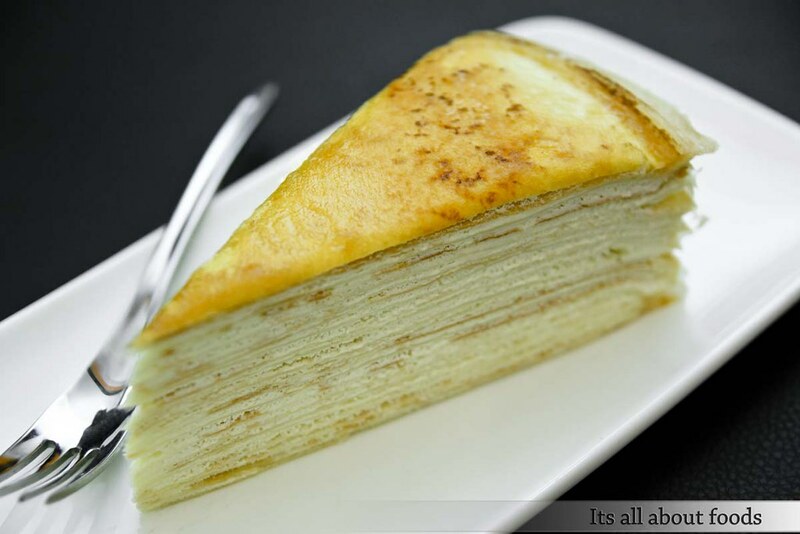 Each layer of crepe is of the same thickness at the side and centre, making up a perfect mille crepe. For mille crepe created by some other shops, we do find them thicker at the centre, but thinner at the side, causing a mountain like shape when we look over horizontally. Another extra point is, their crepe is made using essence from dairy milk, hence more fragrance compare to those made using non-dairy products. Made fresh using only quality ingredients with no preservatives, they can be kept in fridge for 5 days. Among all, french vanilla, swiss chocolate velvet, peanut butter blueberry and oreo cookies n cream are the best seller. Be early for their swiss chocolate velvet, as this flavour are always sold off before evening, which happened to us. Happy to taste their Signature flavour at last- the French Vanilla. Vanilla infused, light, subtle, not overly , just yummy. 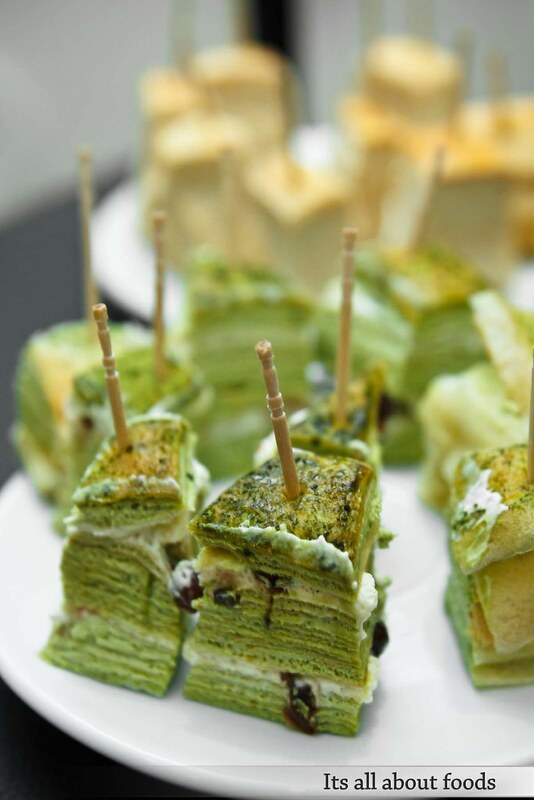 Continue with Matcha Latte(Green Tea), made using highest grade pure green tea powder imported from Japan and loaded with red beans within the fillings. Peach Passion is the girl’s favourite. 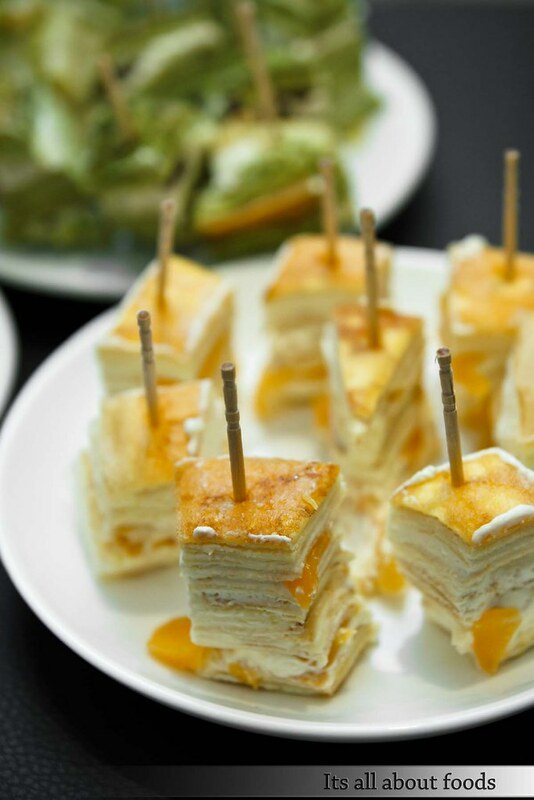 Packed with peach cubes, this mille crepe tastes a little differently from others flavours as it is lighter, more airy and less creamy. 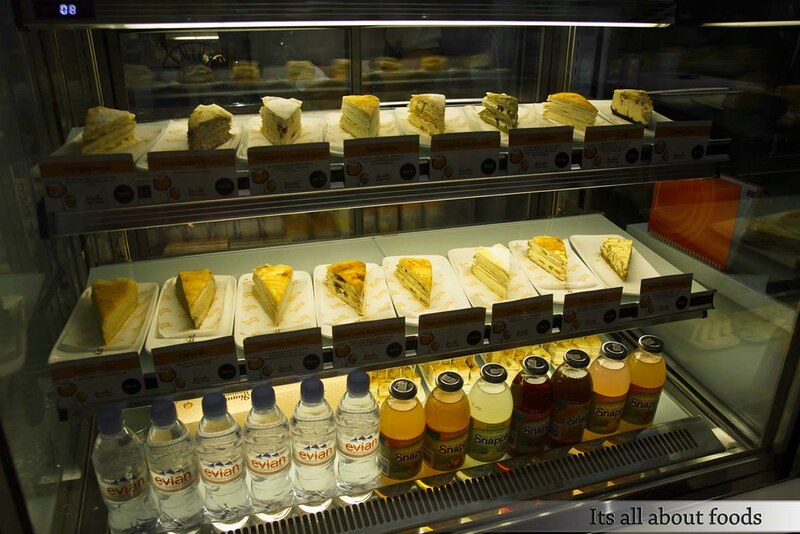 In line with their mille crepe, Humble Beginnings serves quality cheese cake and sponge cake too, which not everyone knows. 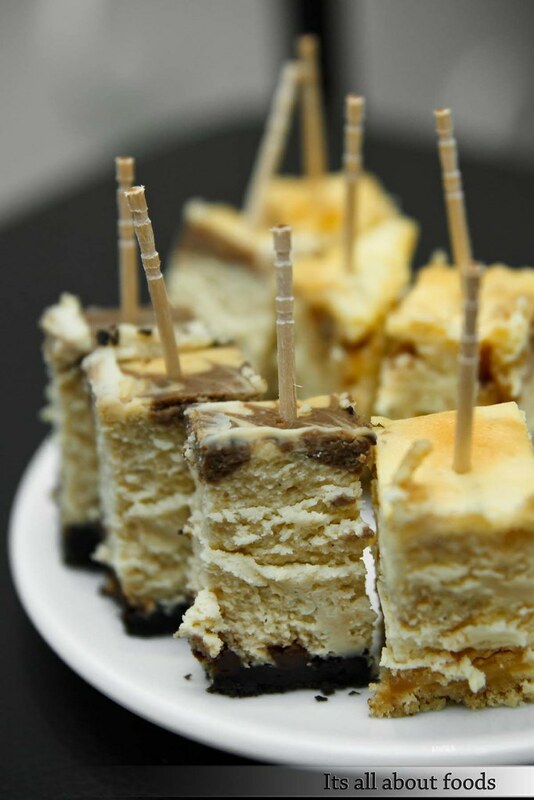 Use only premium cream cheeses and creams, their cheese cakes are nonetheless creamy, thick, rich and great in texture. Love their Mocha Cheese, which has chocolate chips with marbled cream cheese and mocha cheese on Oreo’s base. Almond Brittle Cheese is something interesting, with lots of caramelized almond bits and smooth almond base. 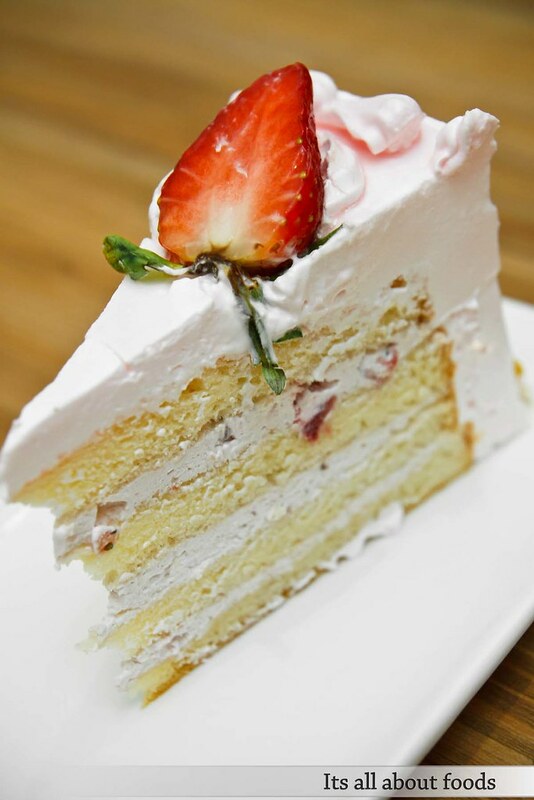 The very last, Strawberry Mille Sponge. Why mille sponge? Because it is made up of four layers of sponge cakes. The strawberry cream topping, though thick, is not cloying at all. In fact, it is so thin and instantly melt in mouth. Definitely a must try enhanced version of the old fashion cake we used to have during schooling days. So far, Humble Beginnings serves only cakes and drinks. 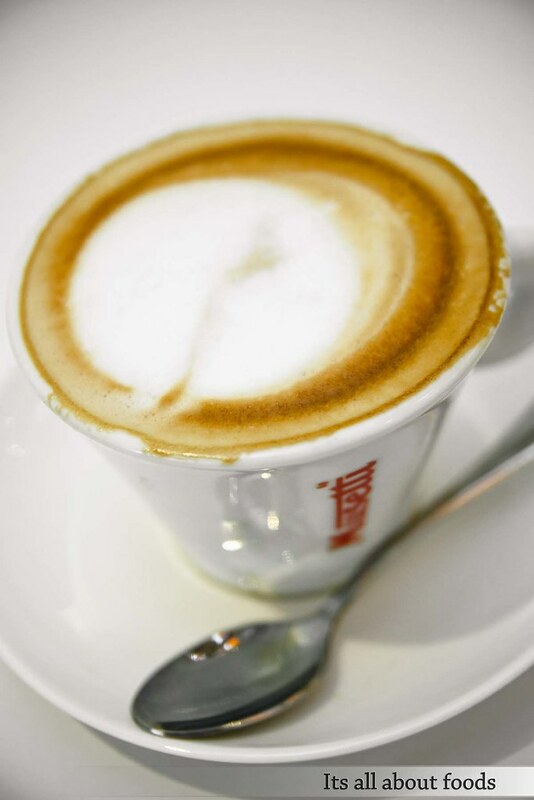 The have coffee menu by Musetti, a local coffee which is worth trying out. Same goes to their refreshing soda such as passion fruit with cucumber soda, passion fruit with lychee soda, rasberry vanilla soda and rasberry blackberry soda, which are specially available in Humble Beginnings. When ask for plain water, what you get is actually branded mineral water with lemon twist. And they don’t charge. Good service. Consumers eat, and they know. 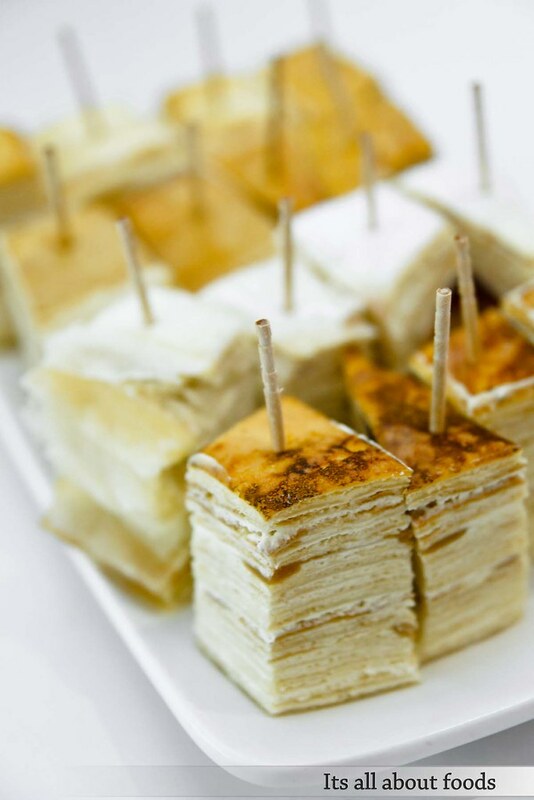 Looking for quality mille crepe? 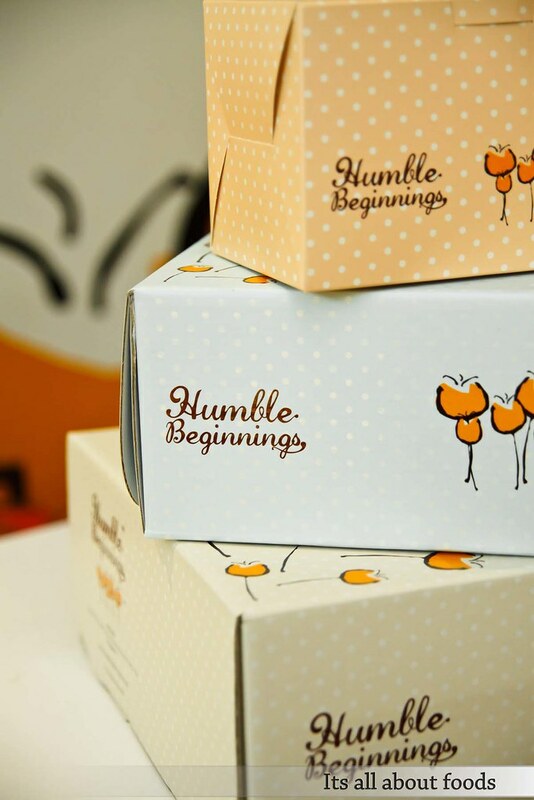 get them at Humble Beginnings. 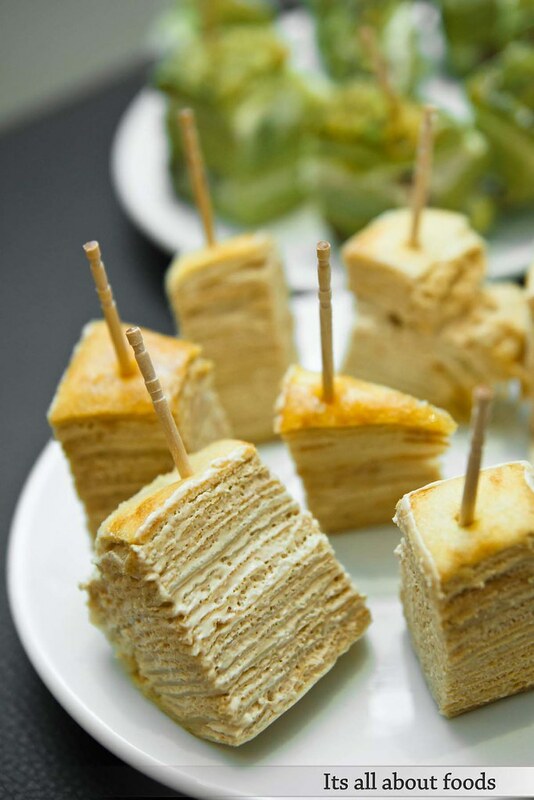 Their thousand layer cakes speak a thousand words. I cant control my mouth to see such type of delicious crepes. I specially like the last two: strawberry mile sponge & cake. I expect good customer service as well as good behavior from Humble Beginning.